Until the late 1990s, only one species of minke whale was believed to exist, the common minke whale. However, in recent years, researchers have determined that enough scientific evidence exists to recognize two separate species. The Antarctic minke whale is found in southern hemisphere waters, where a dwarf subspecies of the common minke whale also exists. The large form of the common minke whale is found in the North Atlantic Ocean and the North Pacific Ocean. Minke whales are identified by a narrow, pointed rostrum (snout) and black or dark gray coloring on the back with gray shading extending up each side in front of and below the dorsal fin. Common minke whales have a white band on both pectoral flippers. The dwarf subspecies of the common minke whale can also be distinguished from the Antarctic minke whale because it is much smaller. Minke whales are very difficult to see in the ocean because they have a low or nonexistent blow or spout when they surface, they surface for a very brief amount of time, and they are usually found alone. Because of these reasons, sound is especially useful for studying these animals. Common minke whales in the North Atlantic, North Pacific, the dwarf subspecies in the Antarctic, and the Antarctic (or southern) minke whale each produce different vocalizations. Common minke whales found in the North Atlantic produce repetitive, low-frequency (100-500 Hz) pulse trains that may consist of either grunt-like pulses or thump-like pulses. The grunts are between 165 to 320 msec long with most energy between 80 and 140 Hz. The thumps are between 100 and 200 Hz, lasting 50-70 msec. Pulse trains last 40-60 seconds and are repeated every 6-14 minutes in bouts lasting several hours. Common minke whales in the North Pacific produce a sound called the “boing.” This sound had been recorded for many years, its source unknown. In the early 2000’s, it was determined that minke whales were producing this sound. It consists of a brief pulse at 1.3 kHz, followed by a call at 1.4 kHz that changes frequency slightly over its 2.5 sec duration. The dwarf form of the common minke whale produces a complex and stereotyped vocalization called the “star-wars” vocalization. It spans a wide frequency range from 50 Hz to 9.4 kHz and is composed of distinct and repeated components. The vocalization is repeated at very consistent intervals that can vary from 1-2 seconds to 3-4 minutes. 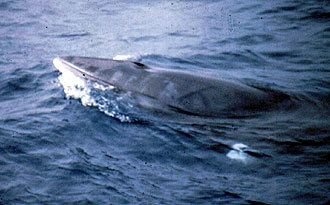 Lastly, the Antarctic minke whale produces a unique vocalization called the “bio-duck” sound. This mysterious, “quacking-like” sound had been recorded in the Southern Ocean for decades, but its source was unknown until 2013. The highly repetitive sound consists of a regular series of downswept pulses, ranging from 50-300 Hz, with an interval of 3.1 between the start of two series. Acoustic tags deployed on two Antarctic minke whales recorded the bio-duck sounds. No other marine mammal species were observed in the area when the calls were recorded, and thus, the bio-ducks sound were attributed to the minke whales. American Cetacean Society Fact Sheet: Minke Whale. Scripps Institution of Oceanography: Voices in the Sea.